Kevin Ames Kevin completed a degree in Music Education, decided not to teach, and is now a professional church musician and choir member (Grace Cathedral) in San Francisco, California. His job is in the insurance industry. Kevin was raised in Massachusetts where his grandmother taught him to knit at the age of 10 or so. His first project, a circular pillow completely done in garter stitch short rows, must have done him in because it was another 10 years or so before he picked up needles again. Kevin, like many knitters, knits everywhere and all the time -- on the morning commuter train or bus, sitting in the park at lunch, walking in the park, and in the evening at home. He knits mostly in order to give gifts to friends and family, enjoying the pleasure the recipients feel. As for knitting likes and dislikes, (they) "tend to center around 3 things - texture, color, and rhythm. I enjoy working mostly with animal fibers. The feel and texture of those fibers are pleasing to my hands, and I find them really well suited to the sculptural quality of cables and the other patterns of Aran style knitting that I enjoy. I like to think of the surface of an Aran sweater as a piece of marble where I sculpt in bas relief. Rhythm also comes into play in the symmetry of the Aran designs. 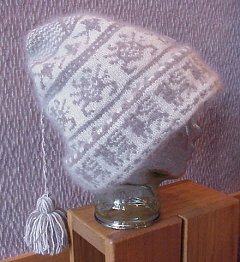 In the last couple of years I have enjoyed exploring Fair Isle knitting. I love the rhythmic shifting of the colors. And there are so many possibilities for variety although built on very small and simple components - OXOs, peeries, and the like. Meg Swansen has spoken of the "songs" that are hidden in the patterns of stranded color patterns. As a singer myself I love this thought and enjoy singing along with the patterns I'm knitting. While it is nice to uncover these songs I thought it would be interesting to design them into the patterns from the beginning. I've just begun a project to design a collection of patterns based upon Gregorian chant. I'm quite excited!" Meg Swansen's Knitting Camp and Meg have had a profound influence on Kevin. It was the MFI contest (see next paragraph) that got him so jazzed about fair isle. Kevin has three original designs on display. All were created as gifts for friends who were also involved in the choice of yarn, color, and garment style. The Aran pullover commemorates a romantic trip to Italy. The pattern features church bells, offset spiral columns from church facades, and the labyrinthine canals of Venice. 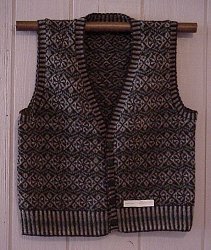 The fair isle vest and the cardigan were designed for entry into the "Millennium Fair Isle (Or Not) Competition" sponsored by Schoolhouse Press www.schoolhousepress.com and Meg Swansen's Knitting Camp. The pattern of columbine flowers on the cardigan was inspired by both my springtime garden and by Elizabeth Zimmermann's watercolors of wildflowers. 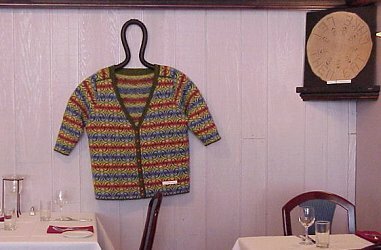 Note: The contest, announced during the 27th annual Knitting Camp in central Wisconsin, has evolved into a book of 32 sweaters published by Schoolhouse Press, available in Spring 2002, entitled "Sweaters From Camp." To take advantage of extraordinary, untapped talent, the contest was open to all past and present campers with the challenge: design an all-over patterned garment using 100% Shetland wool. grandmother who crocheted through every winter evening. As ridiculous as it sounds now, Greg decided to learn it knit in 1978 because he was afraid that if he didn't someday perhaps no one would know how. 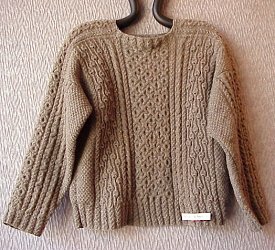 He had never seen another person knit but used Knitting Without Tears (Elizabeth Zimmermann), Knitting From the Top (Barbara Walker) and a how-to-book to get started. Yarns and needles always within reach, Greg's favorite types of knitting are: circular and seamless, never intarsia, almost always wool, lots of socks, lace from time to time, mostly mindless knitting although occasionally making simple knitting impossibly complicated. Greg is the systems librarian at Cornell College in Mt. Vernon, Iowa and teaches at the library school at the University of Iowa. Two of Greg's original creations are in this exhibit. The dubbelmossa (double hat) which is a hat within a hat that ends up with 4 layers of fabric over the ears. It is a traditional design that Greg got started on when Meg Swansen published one in her Wool Gathering in 1991. This one has a parade of animals and much of the inspiration is created by the yarn: "Fairyhare", an exceedingly soft merino wool/angora from Kimmet Croft (www.fairyhare.com or 1-888-Bohus-40) in Wisconsin. This hat was originally to be for Greg's son, but now is Greg's favorite winter hat. 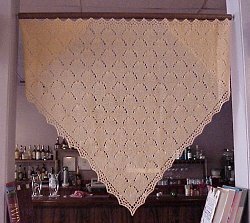 The shawl is EZ's baby blanket from Knitter's Almanac with a different lace pattern (Barbara Walker's First Treasury) and lace edging (from either Barbara Abbey or Furze). Robert Powell Another self taught knitter at the age of 12 or 13, Robert later worked in the textile industry. For 10 years he worked in a double-knit factory as the assistant to the women's wear stylist, Jane Harvey. He learned about color combinations, repeats and pattern coordination as he translated her design ideas into the computer that operated the knitting machines. Another job in color separation work followed. In this textile printing process he learned further what computers could do and learned from Samu Tof how to push them sometimes beyond their limits. A more recent phase of his life has been spent in graphic arts. Robert was born in a small coal mining town in West Virginia, lived in New York, and is now living in Asheville, North Carolina. He continues to knit. Three examples of his finest work can be seen in a recent book, Gathering of Lace, gathered by Meg Swansen and published by XRX-Inc. 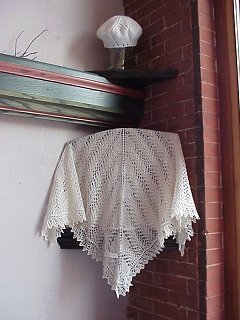 In our exhibit there are several hats from a series "Five Lace Hats" and a lace shawl. Also see more of Roberts pieces above.